Open living room leads to kitchen and to the screened in porch. 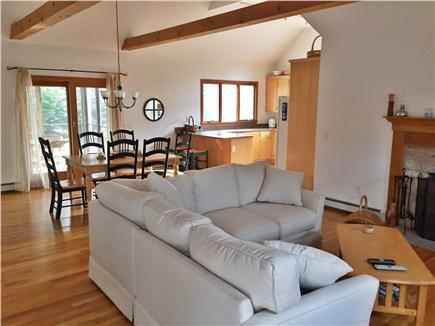 This immaculate North Eastham home is located on the Bay side. 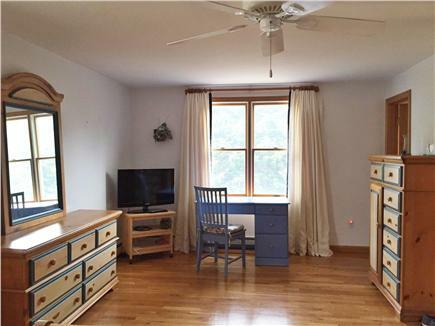 The breezy, open concept interior has vaulted, cathedral ceilings and hardwood floors throughout. 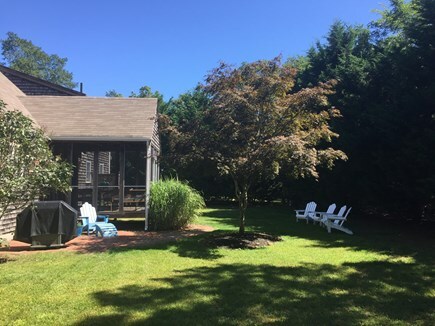 The dining area leads to a large kitchen with breakfast bar and opens to a screened in porch with dinner seating for 6 with access to a brick patio. 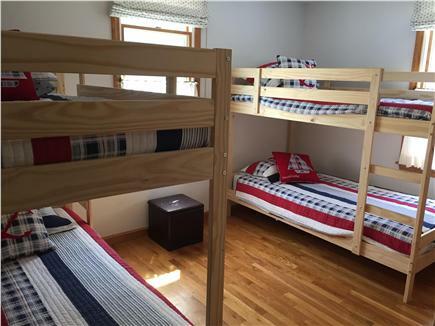 There are two bedrooms on the first floor, one with a queen bed and the other a bunk room with two sets of bunk beds sharing a full bathroom. 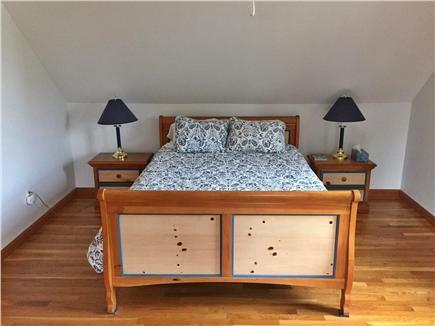 On the second floor is a very large master suite with full bath. 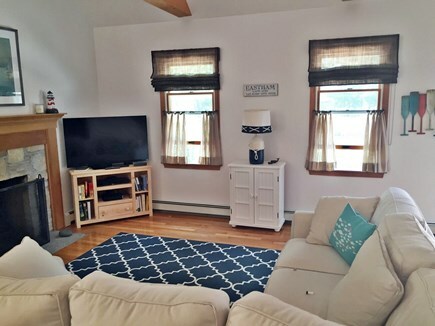 The home is equipped with High speed wi/fi and cable TV. 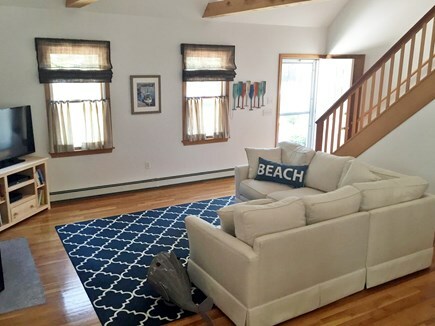 Our home is centrally located to everything, bay beaches with amazing sunsets just under a mile away (cooks brook, sunken meadow), ocean beaches are under 2 miles (Coast Guard and Nauset Light), the Wellfleet Drive-in (1 mile down the road), and the bike path a few blocks away. 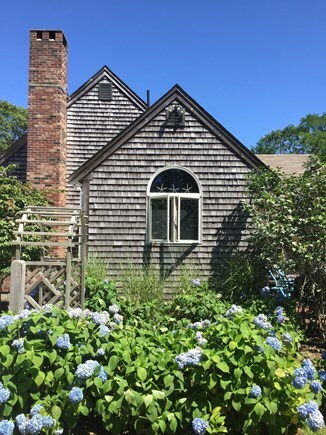 The Wellfleet Wildlife Sanctuary with private trails is a mile away and all that Provincetown and Outer Cape beaches have to offer 20 minutes away. **Linens are not provided** but towels are along with the large capacity washer/dryer. We have beach chairs available and 6 mountain bikes 3 adult / 3 kids and a tag along for the little ones. 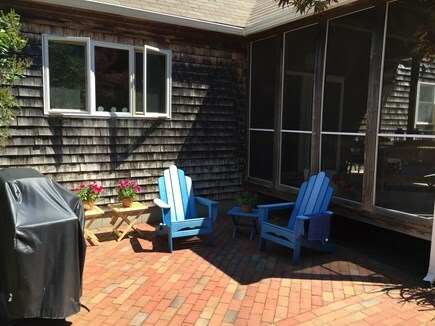 Adirondack chairs for outdoor seating and a new gas Weber grill. My wife & I had a blast over Columbus Day weekend! Few things are better than spending time on the Cape in October... Traffic has thinned out and most of the shops & restaurants are open. To describe this as a cottage or vacation home is a disservice. It has everything you would possibly need. There are 2 full baths, but it's tough to beat an outside shower... The kitchen is well equipped for dinner at home and there are bikes in the basement if you forgot yours. Did I mention the bike path is right down the street...? The layout is perfect for a family vacation, a couple's retreat, or both (actually). 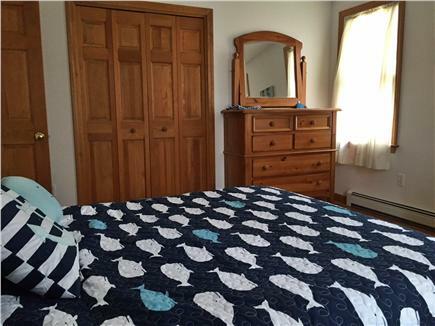 The upstairs master bed & bath provide nice separation from the other bedrooms. 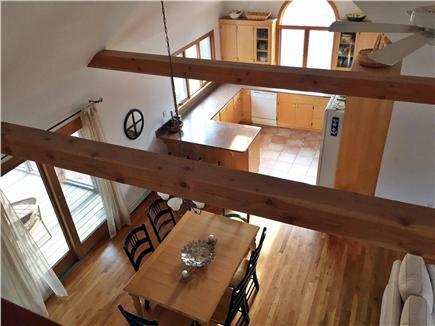 There is a huge living room and dining area off the kitchen which can accommodate everyone comfortably. However, we spent most of our time chilling out on the screened in porch (my favorite feature of the house). 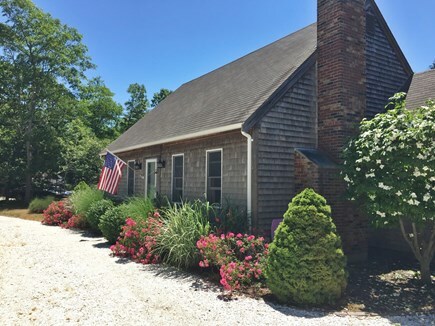 This house is a great place for a family to stay while enjoying the Outer Cape and the National Sea Shore. Excellent beaches, many great restaurants (family and more formal), and just wonderful open spaces within minutes where you can be alone even on a crowded weekend day in the summer. Brad did an excellent job of communicating with us before the stay, during, and after. 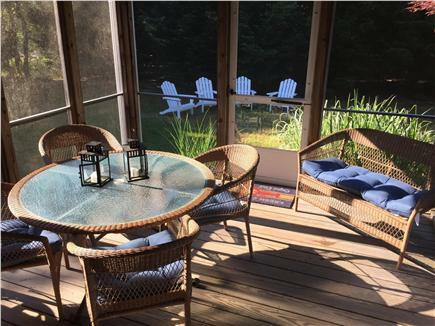 One of our favorite things about the house was the screened in back porch, which hosted an afternoon, post-beach, never ending game of family setback and was great for reading alone in the morning. We truly enjoyed our stay. This house was beautiful- very clean, nice furniture, gorgeous floors- we had a really enjoyable stay here! Good location, and good amenities including towels and linens provided. 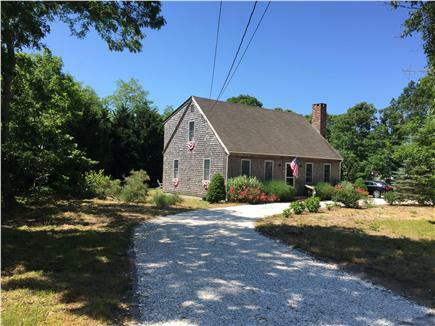 Easy bike ride to bay side beaches, and very close to the CC visitor center and Marconi beach/Nauset Beach/Coast Guard Beach. There is a lovely screened in porch which was a great place to have dinner. I would highly recommend this house.